Grand Som is a spectacular mountain. It is one of the four peaks that surround St. Pierre de Chartreuse, and although it is by no means the highest, it is the one that most dominates the neighbouring valleys, with its huge summit cross visible for many kilometres. Interestingly, the summit is hidden from the centre of the village by a subsidiary ridge. The main ridge stretches north-south to the west of the central valley of the Massif, being abruptly terminated at both ends by the gorges of the Guiers Vif and Guiers Mort respectively. 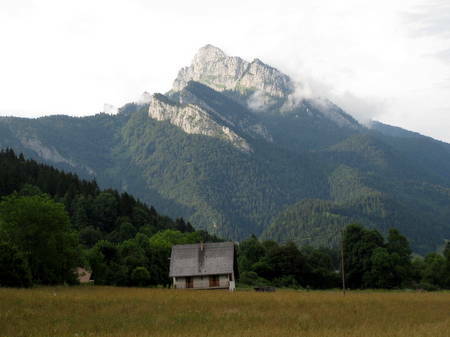 To the east, the mountain is bounded by the road connecting the two St. Pierre's, and to the south-west it falls down to the valley of the St. Bruno, wherein nestles the Couvent de la Grande Chartreuse. It is surrounded, particularly to the north and east, by a huge unpopulated terrain of forests and ridges, criss-crossed by a network of paths (map). Possibly the best route to the summit is from the museum at la Correrie, below the monastery. This goes up to the col du Frenay on the south ridge, and allows a superb round to be covered which eventually descends into the head of the St. Bruno valley. Unfortunately, the Regional Nature Park Authorities have "de-emphasised" this path in favour of muddy tracks which traverse the forest flanks, and care is required in locating the start. The other two routes ascend from the other side of the ridge, and also provide a pleasant day's walking, especially that from les Reyes.